The Piles Care Pack is indicated for the relief of hemorrhoid related symptoms, mostly the bleeding, swelling, itching and discomfort, while at the same time cleansing your system. Trephala : combination of three fruits, clense the stomach, detoxifies system. Kacchnar: it is a type of bark that has anti-inflammatory actions, also useful in tumors, cancer, fibroid, and goiter? 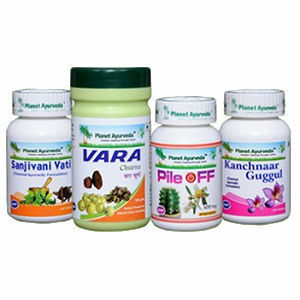 There are a lot of tablets and liquids to take, with Kachnaar and Guggul being taken twice daily, Vara Churna taken as 1 tablespoon twice daily, Sanji Vati as 2 tablets three times daily, and the Piles Off capsules twice daily. The Piles Care Pack weighs in at a whopping $146, which provides 6 bottles of the ingredients. This is much more expensive that the leading products. A money back guarantee is stated, but throughout our research we were unable to find any means of having that guarantee honored. The Piles Care Pack contains some very obscure ingredients, and throughout our research we were unable to find any medically sound documentation showing that the ingredients are effective for the purposes of treating Hemorrhoidal irritation. John Parker	reviewed Piles Care Pack	on October 22nd	 and gave it a rating of 2.